Real Madrid have shown an interest in the possibility of signing Eden Hazard, according to reports. Hazard has been on Los Blancos’ radar for quite some time now, having been linked with a move to the La Liga and Champions League winners for the past three transfer windows. Zinedine Zidane is a known admirer of the winger, and has repeatedly heaped praise on him when the Belgian’s name has been brought up during a press conference. 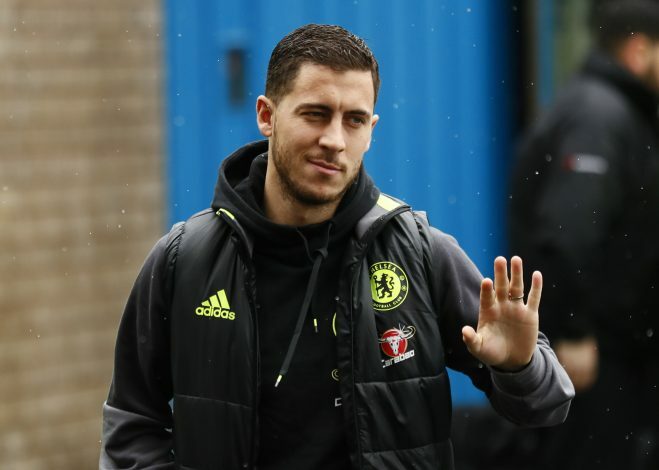 He has remained coy over whether he will make a move for Hazard, but he has stated in the past that the 26-year-old is his ‘favourite player after Ronaldo and Messi’. According to Spanish news outlet Don Balon, Zidane is determined to bring Hazard to the Santiago Bernabeu and see him put on the famous white jersey. Along with the Chelsea forward, the French manager is also planning to secure the signing of Monaco’s mercurial talent Kylian Mbappe, who has a £100 million price tag on his head. In order to fund the two signings, Real are planning to let go of two big players, in the form of Alvaro Morata and James Rodriguez. Both players have struggled to establish themselves in the first team under Zidane, and are seeking moves away from the club following a frustrating season with the Spanish giants. Morata is desperately wanted by Jose Mourinho at Manchester United, and the Red Devils reportedly in talks to sign him. That transfer alone is set to see Real earn in excess of £60 million. Rodriguez, on the other hand, has drawn the attention of just about every top club in the Premier League, with United, Arsenal, Manchester City and Chelsea all rumored to be interested in moving for the Colombian forward. If the two moves do go through, Real believe they will have just enough money in the bank to go all out for Hazard and Mbappe.